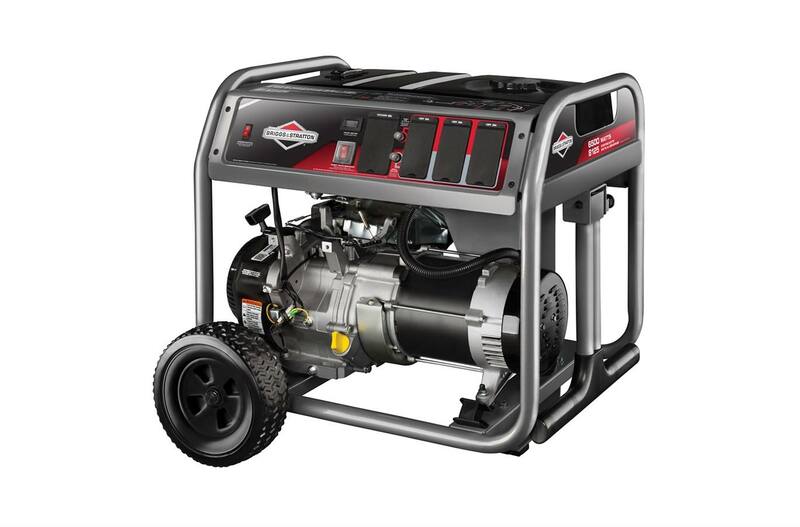 Be ready for anything with this powerful and easy to move generator. Briggs & Stratton OHV Engine (420cc): For long life, high performance, and great fuel efficiency when using your portable generator. Multi-Featured Control Panel: Has six 120V household outlets and one 120/240V, 30A locking outlet for your portable power needs. Also includes rubber outlet covers to protect against the elements. Provides up to 10.5 Hours of Run Time (at 50% Load): A metal 7.5 gallon fuel tank and fuel gauge for more durability and less refueling. Angled Control Panel: For easy visibility in a power outage. Easy, All-Terrain Maneuverability: Featuring 10" Never Go Flat wheels and a fold-up handle. Surge Wattage: The Power Surge™ Alternator produces a short surge of power needed to start large motor-driven appliances and tools simultaneously. Generator per PGMA (Portable Generator Manufacturers' Association) standard ANSI/PGMA G300-2015, Safety and Performance of Portable Generators.